Christian Wallumrød has worked as a musician and composer since 1992, and he is considered one of the most prominent and influential musicians of his generation in Norway. Following his debut on ECM Records (“No Birch”, issued in 1996), he has released a string of albums with Christian Wallumrød Ensemble (CWE) on the same label, all to considerable critical acclaim. The latest record ’Outstairs’ was rewarded with the Norwegian Grammy (Spellemannsprisen 2013). While being the composer and leader of his own ensemble, Wallumrød also focusses strongly on improvisation with another longstanding collaboration, the French/Norwegian group Dans Les Arbres (DLA), also with two releases on ECM. CWE and DLA has been his main body of work over the last 10-12 years, and both groups are touring extensively. A quite recent project is Brutter, Christian’s collaboration with drummer brother Fredrik, a duo dive into human and machine driven pulses. Early 2015 is release time for his first solo album named Pianokammer (on the Norwegian label Hubro). Wallumrød has had long term collaborations with groups and artists such as Sidsel Endresen, Close Erase, Audun Kleive. He regularly gives solo performances and he has participated in a variety of ad hoc constellations with artists such as Susanne Sundfør, Nils Petter Molvær, Ricardo Villalobos & Max Loderbauer, Karl Seglem, Jan Bang, DJ Strangefruit, Oslo Sinfonietta, Kim Myhr. 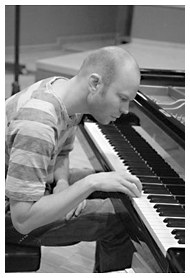 Over the last few years Wallumrød has been commissioned to write for smaller chamber groups (such as BIT20, Håkon Stene, Barolo, BOA). The Ultima Festival (Oslo) and the AngelicA Festival in Bologna commissioned and put on his orchestra piece ‘When celebrities dream of casual sleep (second try)’ in 2013. For their 50th anniversary festival in 2014 Kongsberg Jazzfestival commissioned a piece from Wallumrød with Trondheim Jazz Orchestra.